The Washougal Riverside Treehouse in southwest Washington. A riverside treehouse in southwest Washington may be your next glamping destination. Treehouse glamping seems to be in high style. If you’re heading toward Oregon and need a place to glamp, you may want to check out this riverside treehouse in southwest Washington. Brian Little’s treehouse sits marvelously perched between two trees and overlooks the Washougal River. It’s within the city limits of Washougal, a town just north of the Oregon border — about a three-hour drive from Seattle and a half-hour from downtown Portland. With a fishing net on the wall and model ships displayed on the window sill, Little’s treehouse has an old-time nautical ambience. A small shaded deck overlooks the river below. 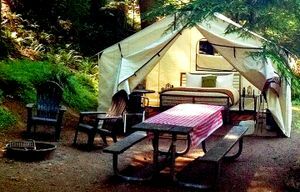 A full-size bed with bedding and pillows is included, along with a microwave, mini-fridge, fan, TV, and Internet access. Access to a guest bathroom in the main house is provided. You’ll also meet Dobby, Little’s friendly three-year-old Chihuahua. Aside from cooling off in the river, many guests drive along Highway 14 to reach the hiking trails and waterfalls of nearby state parks and scenic areas, including the 292,500-acre Columbia River Gorge National Scenic Area. (That’s if they can first escape the numerous breweries in Washougal). 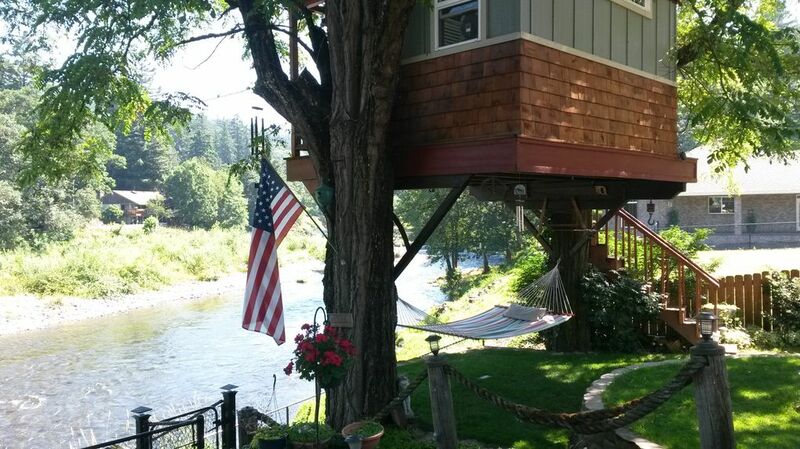 Washougal Riverside Treehouse, $95 per night, Sunday-Thursday; $125 per night, Friday and Saturday. Children and pets allowed. Pets can run free because the area is gated.